Generalizing the findings of Japanese macaque studies, I pursue the question: What kind of ecological adaptation is required for primate to radiate from tropics to temperate regions? There has been no detailed study on the characteristics of of temperate forests as a primate habitat, and comparisons between temperate and tropical forests are by best qualitative. In order to clarify the difference between the two regions, long-term data in temperate forests are necessary. Data on fruit fall has been accumulated in many studies of forest ecology and are easy to compare among studies. In order to clarify the characteristics of fruit production in temperate forests, I examine the general characteristics of fruit production in temperate forest by the fruit fall data of five forests of varying altitude in Yakushima for 2-4 years. Fruit fall varies with altitude and half of them are constituted of one or two non-fleshy-fruited species, such as acorns or conifer cones. Using the same set of data, we also analyzed fruiting phenology. There was an apparent annual periodicity in all of the five forests. The community-level annual periodicity was derived from the population-level annual periodicity of each species and inter-species synchronization of fruiting to autum. Compared with non-fleshy fruited species, such as oaks and conifers, fleshy-fruited species bore fruits in more variable months, including months out of autumn, for a longer period. Fleshy-fruited species may avoid inter-species competition for frugivores by having different fruiting phenology each other. These five forests in Yakushima cover various climate types in temperate forests, so our data would be indispensable to reveal the general chanracteristics of the fruiting phenology in temperate forests. In order to compare the value of temperate and tropical forests as habitats for frugivores, I compared the fruit fall all over the world, including Eurasia, Africa, North and South America, and Australia. Fruit fall in tropical forests was only 1.71 times as large as in temperate forest, of which the difference was much smaller than that of frugivore diversity. Fruit fall significantly affected frugivorous primate diversity, but not frugivorous bird diversity. I summarized the difference between temperate and tropical forests as a primate habitat based on paper reviews and original meta-analysis. I found that in temeprate forests, fruit availability is lower (both in terms of biomass and species composition), fruiting seasonality is higher, annual periodicity of fruiting is higher, flushing seasonality is higher and both fruiting and flushing occur during a limited priod of a year (autumn and spring, respectively). Due to these characteristics, temperate primates are required to survive the lean season with low-quality foods and fat accumulation during the fruit-abundant period and fat metabolization during the subsequent fruit-scarce period can be an effective strategy. Barbary macaques are the only primates in North Africa. They were diverged from other species at the earliest period of time in the genus Macaca. In order to confirm the generality of the findings of Japanese macaque studies, I compared habitat, diet, and leaf chemistry between these two species, with the collaboration of French and Moroccan researchers. These two macaque species shared the tendency to prefer seeds and eat mature leaves for a long time. Tree species diversity in North Africa is much smaller than that in Japan, and Barbary macaques ate leaves which contained more condensed tannin than the food leaves for Japanese macaques. 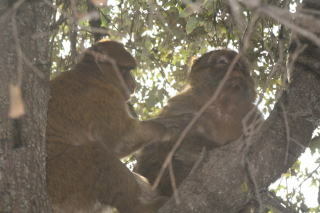 I may be the only Japanese primatologist who conducted fieldwork in Morocco. I collected leaves in 2005 and 2006 for three and one weeks, respectively, with the cooperation of Moroccan researchers. Forest of Atlas Mountains, where Barbary macaques live, is composed of almost only conifers or oaks. It was surprising for me that macaques can survive in such a simple habitat.